You’re just six steps away from an unforgettable Halloween bash. Just keep in mind not all of these pointers are for everyone! 1. Have a really awesome theme: The best Halloween parties are the ones that have a great theme and stick to it, unless that’s just not a thing your friends would be into. Is it “ghosts and ghouls”? Or “zombie apocalypse”? Or maybe your party is the fourth one of the night for your friends, and they don’t want to spend money on multiple costumes. In that case, maybe a theme isn’t the way to go. Just ask around, and you’ll be good to go! 2. Fire up some spooky music: Nothing sets the mood like some classic “Monster Mash.” However, it’s entirely possible that your attendees would actually favor a playlist of pop hits to just generally hang out to. No worries, then! Just do what’s best for you and everyone that’s planning on coming, and you’ll surely still have a great time, right? 3. 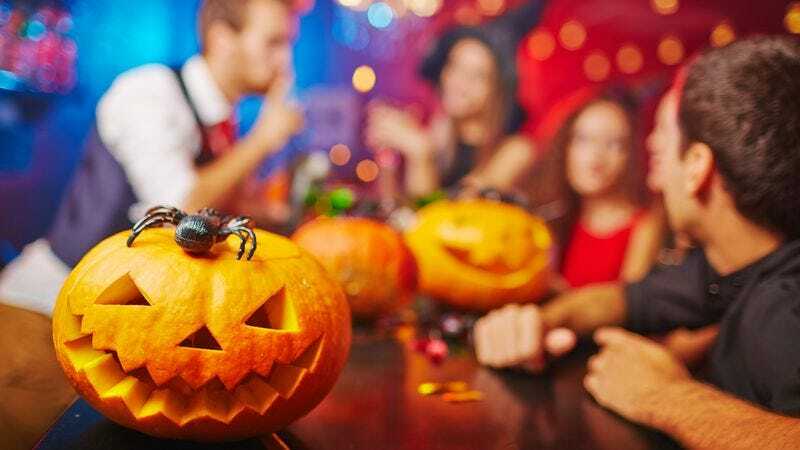 If you’re not into decorations, you can probably just skip this one: Jack-o’-lanterns, skeletons, and spiderwebs will all add to the experience of a scary party if that’s a thing your partygoers would prefer. You know your social group better than we do, so before you blindly take these suggestions, maybe you should simply think about how this will enhance or diminish the experience for your friends specifically. It’s really not even that hard and would probably be the best tip we could give, anyway. 4. Make sure to have a mix of really fun party games: Look, we’re really generalizing here. Is this suggestion for everyone? No. Only you know if your friends will be excited to bob for apples or whatever. We can’t make individual lists for every goddamn reader so, surprise: You’re going to have to do a little work, too, and decide if this one is right for your gathering. 5. Prepare some festive candy-corn cupcakes, or if you hate candy corn or if your friend Alicia has celiac or if you would rather make chocolate cupcakes or if your apartment has a weird gas smell or if you don’t have the time or if your coworker is in charge of the food or if you think you’d mess up the recipe really badly or if you made these last year and don’t want to be typecast as a person who is always making candy-corn cupcakes, or for any of the other infinite disqualifying reasons, do absolutely nothing: Nothing like a sweet treat to bring a Halloween party to the next level. 6. Don’t have the party if your friends don’t like to party on Halloween: We shouldn’t have to say this, but you don’t have to throw a party at all. Why did you even read this list if you know your crew hates Halloween? What the hell is wrong with you? Please close this tab, power down your computer, and throw it in the ocean. Thanks.